I track every major commercial real estate publication in the country, and the psychology within the marketplace is truly fascinating. While I love reading book after book on market history that discuss case studies of the madness of crowds, there is nothing better than to witness it firsthand and wonder how historians will document our current time in relation to the tulip bulb, south sea, dot.com, and real estate manias of the past. If you were to pick up and read all of this months commercial real estate publications, you would believe we are currently in the greatest real estate buying opportunity in history. In 2009 we could look ahead and see $1.2 trillion in commercial real estate loans maturing (needing to be refinanced) between 2010 and 2013. The coming collapse was crystal clear after people witnessed the residential market's attempt to refinance short term teaser loans that were underwater. The graph below shows the loan maturity schedule during the deadly 2010 to 2013 period. However, that great collapse and bargain buying opportunity has not materialized. (yet) Why not? The banking system understood that they could not withstand this tsunami smashing on their shores based on how they were capitalized. 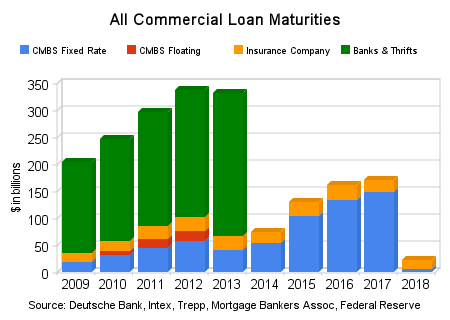 The vast majority of commercial loans, as seen by the green in the bar graph above, are held by smaller banks. The banks have developed all sorts of tools in order to try and diminish the losses on their balance sheet and minimize the write downs. If a bank has to write down more in losses than the reserves they hold, the FDIC arrives on a Friday and closes their doors. One tool they have used to reduce their reserves needed is to divide the loans into performing and non-performing loans. For example, if an office is 30% vacant and 70% occupied, with sleight of hand, they divide this into two loans on their balance sheet. One is 70% with monthly cash flows covering the debt service. The other is now a new 30% loan that is "non performing" allowing them to only need reserves to cover the 30% loan. They are extending loan terms to borrowers, reducing interest rates, and coming up with any creative way possible to keep the loans performing. As an investor you must see through this smoky haze and look at the fundamental value of properties. Prices based on the current cash flow and operating income of these buildings have fallen by 43% from the peak. However, these properties are not yet hitting the market and selling at these values. Investors today are overpaying because they cannot see the hidden shadow inventory waiting on the zombie bank books. The tsunami is hitting as we speak. There has just been a temporary wall put in place to hold back the water. As you can see above we have 3 more years of massive loan resets ahead of us. The pressure will continue to build and build behind this wall as we move forward. As banks pray that property prices will rise again to bail them out, the opposite is happening even with the misplaced euphoria in the market. 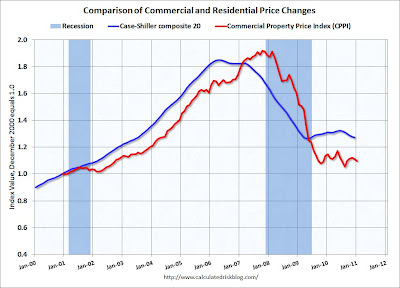 Commercial real estate prices are down 4.3% from a year ago, and 43% from the peak. The delinquency rate for CDO's (packaged loans) rose to 14.6% in February. The banks are zombies. They operate with loans on their portfolio that are worth less than the capital they have on hand. They are on life support. Intelligent investors today are waiting in the shadows for the real deals to hit the market. 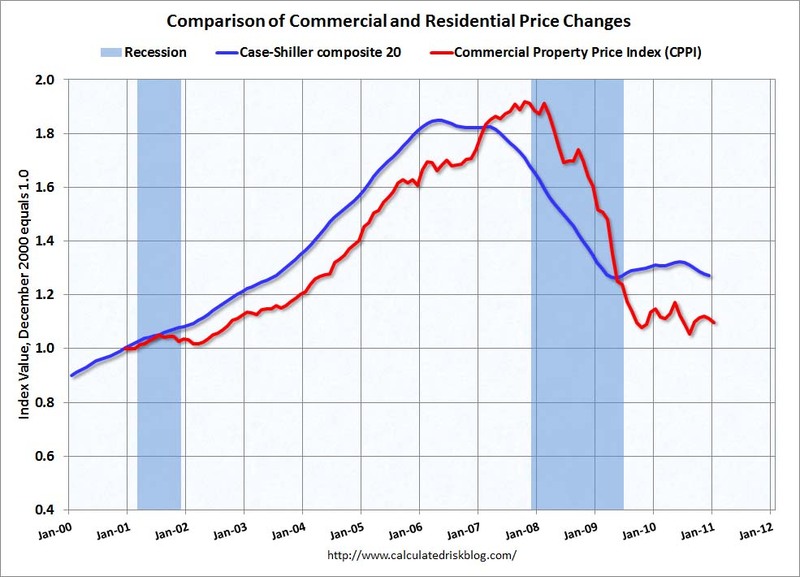 At some point between now and 2014 these properties will enter the market. I cannot tell you when they will arrive and as an investor all you can do is get yourself as prepared as possible for the buying opportunity. 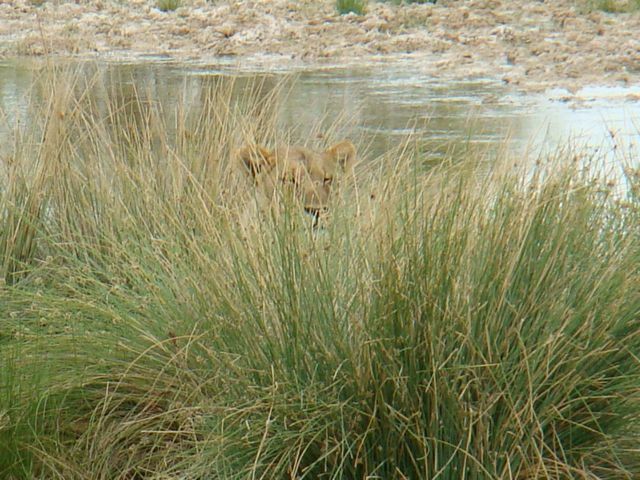 The patient lion who waits in the brush today will soon have the chance to eat its prey at its most vulnerable point.